A supremely confident muslim woman in a headscarf ushered all the bleary eyed tourists off the bus in Kuala Besut at about 5 in the morning. She lead us towards the harbour and to an office where they sold boat tickets to the island. She was rushing people and intimating that we had to buy quickly to make sure we could get on the early boat at 7.30am. I never like this rushed sales tactic and was suspicious but still not fully awake so handed over the cash for a return ticket. We had a simple breakfast looking at the dawn break spectacularly over the harbour walls and waited for the boats to leave. Close to the time we went over to the jetty and paid a 5RM national park conservation fee. Unusually for us we were first in the queue for the boat and had a birds eye view of an English girl in a Trinity College Dublin hoody refuse point blank to pay the conservation fee. She was pontificating at the poor guy from a height. When the gates opened and we were ushered onto the boat she disappeared from view. The guide book warned those with frail stomachs against eating before the speed boat trip. Speed is the word – it was a very comfy and almost brand new boat but it had two monster out board motors which made the small boat with a dozen souls on board practically fly across the sea. The unmistakable dome shape of heavily vegetated tropical islands came into view as we approached Perenthian Kecil, or small island. The first stop was at long jetty leading to Coral Bay but we had decided to try our luck on the other side at Long beach, facing the big island. The water was too shallow for the speed boat to go all the way but a small flotilla of sea taxis pulled up alongside us to take us the 30m or so onto the beach. It was a wide sweep of pristine white sand with a haphazard collection of bars and guesthouses providing a back drop. The Rough Guide had suggested a place which had a dive shop, restaurant and accommodation in one place. Claire stayed with the bags and I went up to see. There were no rooms at the inn. 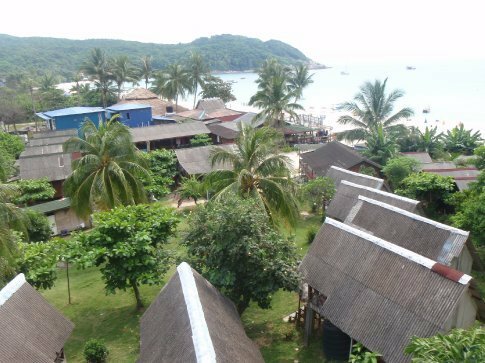 We were going to stay three days on the small island and then maybe go over to the big island, Perenthian Besut for two more. 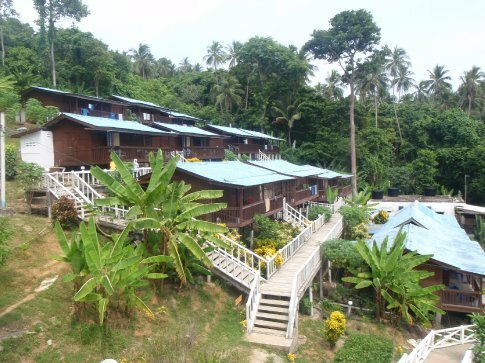 We tried another place, Mohsin Chalet, a collection of blue roofed beach huts stretching up the hill overlooking the southern part of the beach. They had only one room left. It was the cheapest one they had with a fan and and bathroom. We looked at it and for 70RM it was overpriced and dirty (to be fair the people who had last stayed had left a complete mess). They did an offer for 55RM for three days or more. We took it and groggily waited around the restaurant for a few hours for them to clean the room. They turned away about 10 people looking for a room while we were there. It was clearly very busy and we felt lucky to have found anywhere at all. While we were waiting the guy at the desk shouted over at me that I was the last person to get the 55RM price. He had just received a fax from the owner to increase the prices immediately. Now the deal was 75RM a night with free breakfast. We would have to pay for all our nights there and then to get the 55RM price. We signed up for 5 nights – it was such a hassle packing up, moving, finding a room that we decided that it was better to lock ourselves in. The island has no direct electricity connection with the mainland so all power is produced by generator. A sign in the bedroom said there was power 23 hours a day in high season. Given that they were full and turning people away I was expecting it to be high season. We both wanted a nap and it was getting seriously hot – a nap would be painful if not impossible without a fan. The manager, who was really quite rude, said that it was not high season so we would only have power from 7pm to 8am. He made a litany of excuses about why it wasn't high season, my favourite of which was that it was only high season when it doesn't rain. And it had rained a few days ago. Nothing to do with occupancy, demand or time of year. I told him he was a chancer (in a jocular, good natured but serious manner) and we went down to the room, which was now a lot cleaner, for a well needed forty winks. Feeling refreshed afterwards we went for a walk down the beach. Perenthian Kecil is your textbook tropical island paradise. The beach is pure white fine sand with gently lapping wavelets of crystaline clean water. It was far cleaner than either island in Thailand. There is a ramshackle collection of atmospheric restaurants and shops along the middle of the beach after which the dense jungle vegetation begins and covers the island everywhere where the beach is not. I wanted to check out a dive shop that the book had recommended, Quiver Dive Team which was on the far northern end of the beach beside a large 3 storey expensive looking hotel called Bubus. We met John, one of the instructors who told me about how they do things. 1st dive 70RM and subsequent dives 60RM. He seemed a decent chap and I liked the feel of the place so I signed up for a lunchtime dive the next day. We caught some rays on the beach and paddled in the lovely water before showering and having an excellent BBQ dinner on the beach. All the restaurants offer the same deal for 18RM, choice of fish such as barracuda, kingfish or shark with rice or fries or roti, veg or coleslaw, fruit salad and a drink of orange cordial. For three quid its a great deal. Drinking is more expensive, not surprising as it is a muslim country and none of the restaurants serve alcohol. However an enterprising man with a coolbox sits on the beach in the darkness at the edge of the restaurants and will give you a cold Tiger beer if you give him 9RM. Island life is simple enough. But that's what we were there for. We would rent an umbrella for the day in the morning. Alternate between playing beach ball, reading, paddling and snoozing. The occasional break for food and I went off for a dive every so often. It's all very pleasant and very relaxing but somehow we were very tired in the evenings. We did go for a wander though after dinner into one of the bars which provide sheesha pipes for those who aren't allowed to drink for religious reasons. While we were sat on a rattan mat we bumped into Alex who we had met at the bus station. We got chatting and an English gap year type came over and, looking around him, mischievously said he was selling vodka – did we want a bottle. I was curious, how many could he possibly have? He had started out with 48 bottles but only had three left. It was cheap, a lot cheaper than the bars so I bought one but more for the story than for the vodka itself. How did a gap year traveller end up coming across enough vodka to sink a ship never mind bringing it all to a tiny island that you can only get to by speed boat? Someone had told him that a good way to make money was to buy vodka cheap on the mainland and sell it for a profit on the islands. Himself and his mate bought 2 cases each and, being light travellers managed to fit them into their rucksacks. They had found prices more competitive than expected on the island so were only making about 5RM profit per bottle. Fair play to the enterprise. I loved the story. The next day my first dive, my first ever “fun dive” was to a site called Tanjung Basi, off the big island. I was joined by a friendly English couple called Josh and Amy and a Swiss Instructor who was going back to Singapore to, of all things, research Foot and Mouth disease. Josh and Amy had also just learnt to dive on Koh tao so we had plenty to chat about. I was excited to use the dive computer for the first time but was so busy waffling on the way out in the boat that I forgot to set it up. Thankfully it's so idiot proof it did everything on its own. It became clear very quickly that diving here was far better than in Koh Tao. Visibility was over 20m and there was a much greater volume and variety of sea life to see: all the usual suspects, sting rays, bannerfish and clownfish but for the first time I saw jellyfish underwater and long needle fish just under the surface. 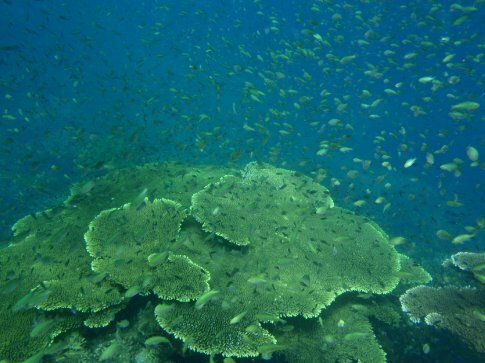 We also saw a feeding frenzy of lots of fish gorging on hard coral on the dive which lasted just under an hour. The water was 31°C throughout – we were spoilt. I was also delighted to have a full profile of the dive shown on the computer. I admit it, I had become a diving nerd. Back at Quiver cleaning up our gear Josh and Amy mentioned they were leaving in a few days but wanted to do one more dive. They had been to a place called the temple of sea a few days before and said it was amazing. They wanted to go back for their last dive and asked if I would go? Of course I would! After another chilled out afternoon on the beach Claire and I went back for more BBQ. So good! One of the good things about Mohsin Chalet is the fact that when the power is on in the evening there is Wifi. Ok sometimes. It was very intermittent and unreliable but wifi nonethless so we were able to catch up on news and email in the evenings too. Sometimes! Dive 2 was to temple and it was the most challenging dive I had done. There was a huge current when we got there which meant we needed to use a current rope, to keep us from drifting off as soon as we jumped in (backwards, as is the style here necessitated by the diminutive boats used). Michael, the Austrian Dive Master leading us had trouble keeping the group together as we descended down the rope. It was like being in a gale force wind, except under the water. The fish, who are supposed to be in the environment seemed to be struggling in the current. It was very disconcerting and all i could do was concentrate on keeping hold of the rope. If I let go I felt I would end up in the Philippines. Eventually when we got down to our maximum depth the current eased but the visibility was right down to 5m. The Temple of the Sea, that I had read about in the Rough Guide and that had been the clincher for us to come here felt more like the Temple of Doom. I exaggerate of course. It was a short dive. I was stressed at the beginning and had been gulping air. The first time I looked at my air I had over 150 bar. The second time I looked I had jumped to 60, only 10 away from needing to start to ascend and do the safety stop. I only lasted 34 minutes, my shortest dive so far. We did however see a few Bamboo sharks hiding under a few rocks as well as some box fish but for me it had all been about getting to grips with the current and learning how to deal with it rather than enjoying the scenery. I was discovering that there is no such thing as a bad dive, only adverse conditions. I felt bad for the other more experienced divers who had plenty of air left though. Eric, the jolly, experienced Swede who was with us admitted it was the strongest current he had ever been in. But he still had lots of air. I was definitely going to have to work on my air consumption. After all that stress it was high time to take a break from diving for a while. Plus poor Claire had been left to her own devices on a beach where most people are too busy trying to look cool than say hello and was going slightly mad. We booked a snorkeling tour for the next day and had some more beach time. We were getting pretty good at beach ball at this stage. That evening I had arranged to meet Josh and Amy at the opening of a new bar at the Southern end of the beach. It was huge and much more organised than most of the other places but had prices aimed at tourists rather than backpackers. We rocked up to the cavernous open-air world cafe at 8 so we could eat before the guys arrived. We were just about to order chile con carne when the English waitress, who looked like she had been at the last full moon party and had been roped in at the last minute, told us that it was only pizza and pasta that night. An hour and a half later it had yet to arrive while Josh and Amy were dead on time. To be fair to them when they noticed the problem (I think the kitchen forgot to cook it) they gave us a round of drinks and a 20% discount and the food was tasty when it did arrive. But when you pay London prices you expect London service. All the more when they slyly slap a 10% service charge and a 7% tax on the bill. 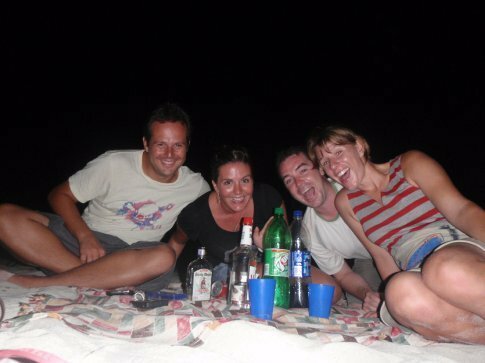 The guys had brought along some rum and we had the illicit smuggled vodka and the portable speakers with us so we found a spot on the beach and had a great evening. We all had a lot in common, living in London and travelling. Josh and I had a tunes-off with our ipods. I'm sure we'd both say we won hands down. Things got quite raucous towards the end as the tunes attracted a bunch of locals. Although they were muslim they seemed quite happy to drink with us and take what was left of the alcohol off our hands when we decided to call it a night and bade farewell to the guys who were leaving in the morning. So it was that we were a touch hungover for the snorkeling the next morning but that disappeared as soon as we got into the water. There was a good group on the boat too, a gaggle of gossipping Aussies on a girls away holiday, a Swedish couple, a Malaysian who looked and sounded distinctly English and an older Aussie guy with an Asian girlfriend who didn't open her mouth for the whole trip. The first stop was back on the other side of the island near a sea lighthouse about 2 km off Coral Bay. It was fabulous with excellent visibility and lots of fish around. One type of fish, with black and white stripes are quite fearless and come towards you while most veer away into the deep. I put my hand out to one and it took a bite. No damage but I wasn't expecting an attack! I managed to take a few snaps but after while taking a video (the one above) my worst nightmare happened. The waterproof camera told me to close the battery door. The battery door was clearly shut! I cursed through my snorkel and went back to the boat to let it dry off. What is it with me and technology! Next up was Shark Point, at the southern tip of the big island. The guide took us himself this time, and after about 10 minutes lo and behold a black tip reef shark, about 2 m in length, majestically came into view behind us, had a look at us and carried on into the distance. It was very impressive. A few others came and went but were hard to see unless you were in the right place at the right time. The final site of the morning was “Secret Turtle Place”. Claire and I were really keen on seeing a turtle. 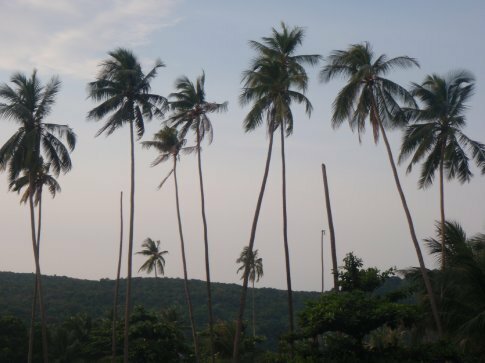 Koh Tao actually means turtle island in Thai but they are no longer there or very rare at best. They seem to be going that way on the Perenthians too as it they don't go to the reefs near the beaches any more. The point was mid way between the two islands and one quickly came up for air near the boat before going back down. We all piled off and followed for a few minutes till he sped off. They're really cool creatures, looking clumsy, wise and comical all at the same time. A few others came and went while we were there. I saw one eating a large jellyfish. It must have been lunchtime – for us as well as the turtles. We half ate a really nasty fish and chips at a cafe at the functional fisherman's village on the small island. We should have gone for local food they can cook it better. It was nice to have some time out of the sun and off the rocky boat though. After lunch we went to what was the best coral reef I have ever seen ... diving or snorkelling. It was called Coral gardens, just off the west coat of the big island. 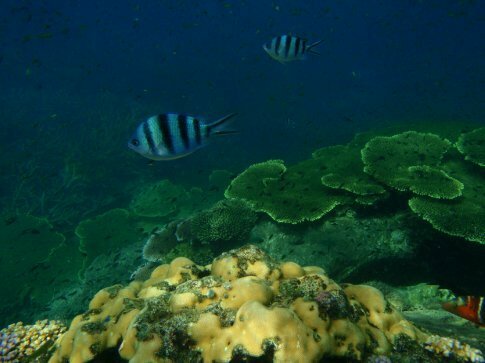 There were huge table top corals, needlefish everywhere and big bumphead parrotfish aswell as sea anenomes with tiny clownfish darting in and out. I've never seen the Great Barrier Reef but Claire said it was very similar. The final spot was Turtle beach, a beautiful spot where the turtles come to lay their eggs in the season. They have very good taste but I wondered why we were allowed there. Surely lots of tourists have an impact on their habitat? Instead of lounging on the sandy beach we made for the coral around its fringes. Claire hadn't bothered with her fins (I always thought they were flippers but everyone in the diving community seemed to call them fins so I'll go with that). As a result she was a little slower than usual. We came up behind a larger fish which swiftly turned around. I recognised it instantly as a Triggerfish which are territorial and aggressive. It had big momma lips behind which rows of sharp teeth sat scarily. It started to come towards us, clearly aggrieved with our presence. I immediately backed off and go around its patch of water, having been told by Terry never to swim over it. Finless Claire wasn't so fast and it started gaining on her but thankfully we had enough of a head start for it to lose interest after an alarming 30 seconds or so. The Aussie guy (with the quiet girlfriend) who was nearby said he saw it happen and he was “worried for a few seconds there, mate”. He had been enthusiastically pointing out things over the last few minutes and moaning about something called a crown of thorns which he said eat the coral. He pointed one out, a large star fish that, hence the name, looks like a filled in crown of thorns. As well as eating the coral they are highly poisonous. The guy found some sticks and fishlike, dived down to the starfish. He then poked and poked it with the sticks until he had a hold on it, taking it up to the surface and threw it onto some rocks. I asked him afterwards what he was doing and he said protecting the coral. He said that over fishing was depleting the stocks of larger fish which prey on the crown of thorns. I felt that as snorkelers we should be observing not interacting with the wildlife. Not sure about the correct moral stance really. 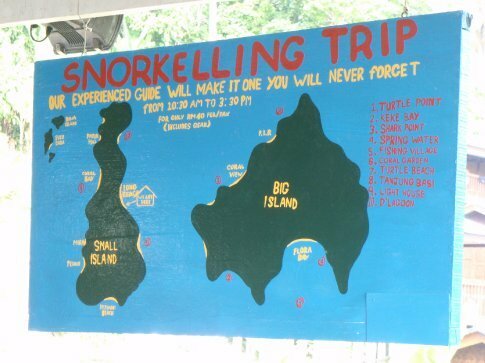 In one day we had seen as much, if not more snorkeling than I had in all my dives on Koh Tao. It was incredible, and great for Claire to finally see for herself what the appeal was about diving. We decided to try one of the different restaurants for dinner, also a BBQ. An hour after ordering we still had received nothing despite asking for our drinks twice. When I saw the waiter tucking into his own dinner I went up and asked him where ours was. He lazily called our order over to the BBQ man. We voted with our feet. We weren't having much luck with food these days but got what we wanted back at the BBQ. That night Claire woke me up worried with a rustling sound in the room. Once again I sleepily dismissed it and about 30 seconds later realised that she was dead right. Geckos had been a regular feature of our lives for the past few months but never had one been so intrusive. When I turned on the light I saw a big one scurry across the floor under my bed. They seemed to just love rustling about in the random detritus of our belongings. I decided to get back on the horse the following day. Quiver were going back to Temple in the morning and I signed up – I wanted to give it another chance. I was well rewarded there was no current at all and visibility was over 25m. John the instructor I had met on the first day lead this dive and he said it was the best he had ever seen it. There were shoals of literally thousands of yellow back fusiliers and more of the usual suspects than I had ever seen. The breadth and array of fish was staggering. I won't go through the lot but my favourites were a moray eel who looked like he was having a look out his front door of rocks and a shoal of squid. Squid are really unusual looking animals with a strange backward looking anatomy and a clever jet propulsion system. Very much the best dive so far (sorry Terry, the surroundings were better!). Back on land, I discovered that both Claire's wallet and flip flops had been nibbled on through the night. It seems the lizard was just hungry. But if he had any sense he would steer very clear of any of Claire's footwear in this climate. We spent the day once again under an umbrella on Long beach and then went over the jungle path to Coral bay to do a sunset snorkel. It was sad to see all the dead coral having been so clearly impacted by man's presence and the onward march of “progress”. The one remaining section of coral was quite impressive but it was a complete contrast to the abundant life seen the previous day. We did see a big monitor lizard on the way over though which was some consolation. 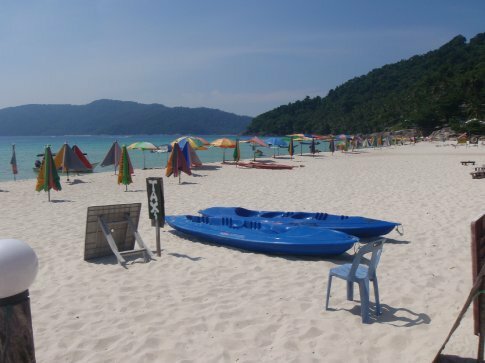 It would soon be time to leave the island so we arranged our return speed boat trip and the night bus back to KL with the veryfriendly man in Lazy Buoy's shop. The timing allowed me one final dive in the morning. Hooray! Back to the BBQ place one more time for dinner. It was our last night so we thought we might as well go with what we knew rather than risk any more service disasters. We had an early night after packing up our gear, as much to prevent hungry lizards eating it as for the requirement (for me) to get up early for the dive. The final dive was to Sugar wreck, a 90 meter cargo ship that sank in 2000. The ship hauled sugar, hence the name. It was a calm day and there was no current as we put in. Eric and his girlfriend were with us. As was, surprise surprise the girl who had refused to pay the park conservation fee. It turned out she was a divemaster at Quiver. I'd never been near a wreck before and it was great sight to behold. She was lying on her side in around 18 meters of water and it was visible how it was becoming a reef. There were corals and shells growing on the hull and a whole ecosystem now calls the place home. There was heaps to see: huge puffer fish and porcupine fish. A Scorpion fish almost hidden on the hull. A lionfish wandering around the mast. I also found out what the sign for a bat fish is, my fave so far (you swing a baseball bat – I love it!). I have to admit this dive was up there with the temple. Even Michael who is pretty low key about things said that it was better visibility than he had ever seen at that site – he usually can't see the length of the mast where we could see what seemed like most of the ship. A great way to finish up the dives. Afterwards there was only just time to grab some food and then it was time to say our goodbyes back at Quiver. The guys very kindly let us have a shower and a change of clothes before our taxi came to take us to the speed boat. It was a bit choppier on the way back so the speed bumps were more exaggerated. There was a bunch of older Italians on board who were terrified by the journey. As soon as we got off the boat they were off trying to complain to the police. Perhaps they should have got the slowboat. There was a wait for a few hours until the night bus so we holed up at a very friendly cafe in the nondescript town of Kuala Besut. I wrote the blog for a few hours and Claire got deeper into Shantaram. We had dinner there too which I thought was tasty but the dish Claire ordered involved a lot of MSG which she doesn't react well to. A dose of Buscopan and a lot of “windypops” later she was finally feeling better. Just in time for the bus to take us back to KL. Surprisingly it was the first time on the entire trip, apart from organised tours, that we had done the same journey in two directions, in effect retracing our steps. Not bad going.